DSSSB Recruitment 2017 Notification announced by the Delhi Subordinate Service Selection Board. Apply Online for 1074 Grade IV Dass, Statistical Assistant Jobs through www.dsssb.delhigovt.nic.in. The DSSSB application process starts from 1st August 2017. The closing date to submit the DSSSB online application forms is 21st August 2017. In the following sections, get the details of educational qualification, age limit, pay salary of DSSSB Grade IV Recruitment 2017. Latest Update on 7th August 2017: Delhi Subordinate Service Selection Board had released the latest Notification for 15054 PGT TGT Primary Teacher Vacancies. Interested and eligible candidates know the eligibility details @ www.dsssb.delhigovt.nic.in. The Online application procedure commences from 25th August 2017 to 15th September 2017. As the official advertisement is out, Govt Jobs interested candidates apply for DSSSB 1074 Clerk Draughtsman Grade-II Field Assistant Jobs by going to the official website delhi.gov.in. Coming to the educational details, aspirants who have completed Intermediate/Graduation/Post Graduation are eligible for the DSSB Grade IV Dass Jobs 2017. We know that every day a huge number of candidates are searching for the Latest Employment News. For job hunters, this DSSSB Job Notification 2017 will be very useful. So, don’t waste even a single second and check the official Delhi Subordinate Service Selection Board Recruitment 2017 to get clarity about the vacancies available in various categories. The Board authorities of DSSSB will recruit the most talented candidates by conducting the Written exam and Skill test. So, eligible aspirants after successful submission of the application forms before 21st August 2017, prepare for the written test. For the convenience of the exam applicants, we are providing the Syllabus and Previous papers links on this page. All the interested candidates before applying for the DSSSB Grade IV Recruitment must make sure they are eligible or not for the posts. The eligibility criteria specify the age limit, nationality, and educational qualification required for the multiple posts of Delhi Subordinate Service Selection Board. So, check the eligibility conditions in the below section. Check the qualifications for the various posts. 10+2 along with Typing/ Computer knowledge for DASS Grade IV. Post Graduate for Statistical Assistant posts. Refer to notification page for post wise educational qualification details. The organization will hire the brilliant candidates by checking their performance in the following rounds. For Post 3-5,8-10: Rs. 9300 – 34,800/- Plus Grade Pay Rs. 4200/4600/. For General Category candidates Rs.100/-. For SC/ST/PH/Ex-S candidates there is no application form. The Board is inviting the application forms from the eligible candidates to fill 1074 vacancies.So, those aspirants who are willing to apply for the DSSSB Recruitment 2017 can get the application form at the official site @ dsssbonline.nic.in. Moreover, candidates who submit the DSSSB Online Application Forms on or before 21st August 2017 are eligible for the written exam. To avoid the confusion in filling the registration forms follow the below given steps. Visit the official website of Delhi Subordinate Service Selection Board www.dsssb.delhigovt.nic.in. 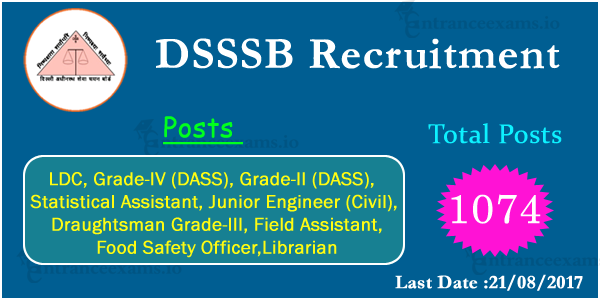 On the home page click on the DSSSB Grade IV Dass Recruitment 1074 Notification. Go through the official advertisement of DSSSB Grade IV Statistical Asst Jobs 2017 carefully. Candidates who are eligible for the jobs click on the apply online link i.e., www.dsssbonline.nic.in. Fill the application form will all the required details of name, age, qualification. Then upload the scanned documents and passport size photograph of the applicant. Next, pay the application fee as per the category given in the notification. Later, click on the Submit button, then the DSSSB Recruitment process completes. At last, take the printout of the DSSSB Grade IV Dass Recruitment Application Form for futures use. DSSSB Grade IV Dass LDC Statistical Asst Recruitment 2017 Notification. Candidates stay tuned to our site www.entraanceexams.io for the latest updates of DSSSB Recruitment, upcoming Govt jobs and Entrance exams.